On the eve of the winter holidays, each of the tourists begins to dream of their perfect journey – someone is more interested in beaches on the coasts of amazing Sri Lanka, and someone is looking forward to the snow, fireworks and Santa with gifts. If you have long wanted to go to Europe, but you still cannot decide when to go – Christmas is the right time! Moreover, there are dozens of modern beneficial services for the tourists, like rentalcars24h.com car rental, which are making the holidays perfect. Lovely European towns are similar to the old magic caskets opened in front of an inquisitive traveler. The capitals and small villages are all equally sweet, welcoming and hospitable: brilliant Vienna and shining Paris, elegant Bern and tiny San Marino, mysterious Prague and a lot of wonderful provincial towns that Europe is so generous for. Here on the steeples of medieval bell towers lie the most fluffy and white snow hats in the world, as well as a couple of centuries ago, the organ-grinders extract melancholic melodies from the antediluvian apparatuses, and the aromas of coffee, chocolate and freshly baked buns with raisins dance in the air. The streets are immersed in the radiance of the New Year lights. It is certainly worth mentioning the Christmas trees – more precisely, absolutely picturesque firs, decorating cozy squares – it seems they are grown specifically for this purpose. Among other things, in the New Year’s Europe, you can make bargain buys, as perhaps there is simply no store, which does not participate in the Christmas sales. The expectation of Christmas completely transforms the whole city of Prague. It smells like roasted chestnuts outside, and light snow on tiled roofs looks like powdered sugar. Go for a walk to the Old Town Square and Wenceslas Square: they are decorated with the most beautiful and noisy fairs. Here, the actors arrange costumed performances, and in a manger, lambs and ponies chew hay. Buy a horseshoe for luck, which the blacksmith will make right in front of you, try the trdelnik (old-Czech baked delicacy) and local mulled wine. On the main shopping street (Na Prikope Street), it is great to arrange shopping, and for the authoring gifts from Czech masters, you should visit the Manes gallery. In the Church of St. Nicholas, do not miss the organ concerts, and in the Old Town Hall, you can listen how people sing carols. Do not forget to look at the winter Prague from the 66-meter height and release the carp into the river for good luck – then the New Year will surely be happy. 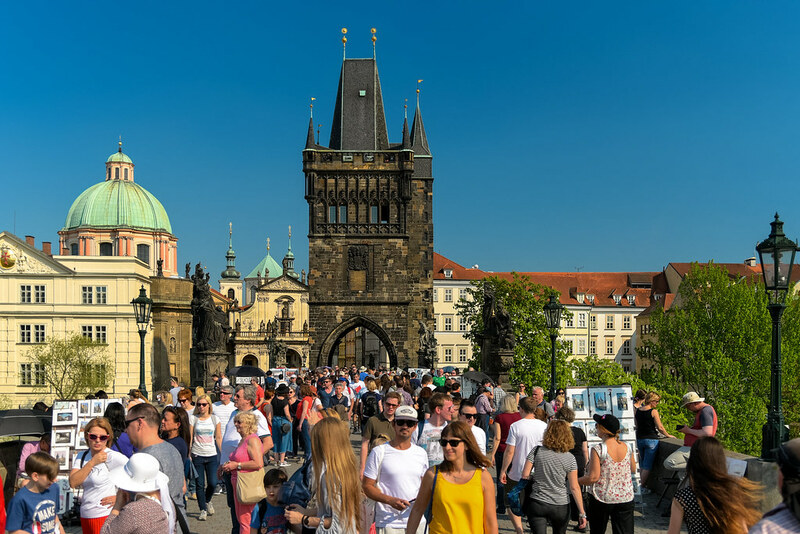 The Prague Fair on Old Town Square takes place: December 1, 2018 – January 6, 2019. At fairs, mulled wine is often poured into painted ceramic mugs, which are given on bail for a token value. You can return the mug and get the money back, or you can leave it as a souvenir. During the Christmas holidays, moderate winter weather prevails in Prague: the thermometer is at the level from -5 to +5 ºС. Often at the end of December, heavy snowfalls occur, but the Czech utilities quickly eliminate its consequences. Nevertheless, the humidity is very high, so travelers, who decide to celebrate the New 2019 in the capital of the Czech Republic, are recommended to take a scarf, a hat, an umbrella and gloves with them. In Prague, there is a huge variety of old New Year traditions, customs and fascinating rites. The St. Nicholas Day, which is celebrated here on December 6, opens the Christmas holidays. This is a favorite children’s holiday, when St. Nicolas walks along the streets with the Good Angel and a masked devil and asks the kids of their behavior during the whole year. As a reward, all obedient children receive sweet gifts. A week later, on St. Lucia’s Day, girls in white clothes with powdered faces and big wooden noses come out to the streets. Their goal is to frighten passers-by until they are given sweets. In winter, Prague is one of the most attractive cities in the world. Therefore, there are thousands of tourists. If you do not stand the crowd, escape to the tiny medieval Český Krumlov with its gingerbread houses, bridges and a real castle. It is located about three hours from the Czech capital. Another interesting castle – Karlštejn – is located only 30 km from Prague. During one vacation, you can also visit neighboring Germany. In Dresden, you will find the colorful Christmas market, called ‘the Strziel Markt’.